Activity has continued over the festive period and drafting work on the Code has continued at a pace. 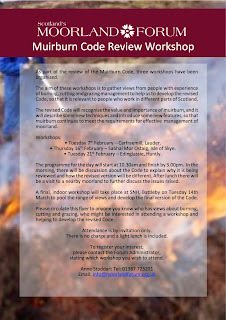 This will be made available in printed form before the workshops and also on the www.muirburncode.co.uk website - there is a technical problem with the website at the moment, but this will be resolved in the next few days. The amount of additional information we will be providing as part of the Code is increasing. It had always been anticipated that some more detail on muirburn for grazing management would be useful, and this was endorsed by the Steering Group during the meeting last month and a sub-group is working to develop this. I will be meeting with SEPA, this week, and this may identify a need for further guidance on water management. Although some of the items on the list in the latest version of of the Code may not be completed initially, the full list of proposed Additional Information is at the bottom of this post. Fire Behaviour and Effects, and the Relationship with Wildfire.